Bit’s ‘n Pieces 1, got soooo big that I’ve had to start a Bit’s ‘n Pieces 2! So proud of husband John, runner-up in the Edithvale Club C’ship 22/25 after 3 months with a bowling arm. He was once a Div. 1 Skip (before Premier), and won the “Mentone Skip of the Year” award as a Div. 1 Skip. He was also a Div. 1 Skip at his current club Edithvale, when they had one. He was about to walk away from bowls, as his health failed, too proud to use an arm, even tho’ he had a card to do so 5 years ago, he spiraled to lower sides. His older mates shamed him into “not” using an Arm. (5 years wasted as he slowly embarrassed himself, failing to be the bowler he once was.) With the Arm (John chose the Dart Release, and we are indebted to Rick Haddrick for his design which made the changeover from hand to device bowls so much easier.) John has done exceedingly well in a short time and has “got his hunger for bowls back” Thank god, or whoever, for the “bowling arm” and getting my husband “back on the greens”. Poem by John Baker (Mooroolbark) to mate “Col” – We can all learn from this! Queensland’s Awesome Foursome, will be competing today 5 Dec ’18. “We’ll be watching this bunch of swingers with interest today via the internet. Could be the first time three members of the Q’ld Team are Arm Bowlers. Cheryl Hutchinson, Heather Hodgson and Wendy Usher are joined by Vicky Dunn and looking for a good showing in the play-offs.” “Go Q’ld”. Thanks Geoff Geary for alerting us. Thanks Peter Dixon for a great day at Beauy on 7th Nov. ’18 (Best 4th Game). “Coops” wins Club Vet’s Singles at Kawana. “Winners are Grinners.” After 4 tough rounds, Geoff Cooper won the final of the Clubs Vet’s Singles. Geoff represented Q’ld in the 2018 National Armed Sides C’ships at Newcastle. Geoff, your a true gentleman of the game. Congrats from ABA. 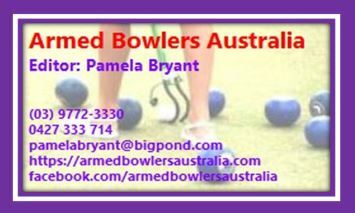 Congrats to Armed Bowler Barry Anset on again being selected to the Bowls Vic. 60’s and Over Senior Men’s Side. Rule change for Armed Bowlers, as notified by Bowls Queensland. N.S.W. Squad member Pam Martin won her first Minor C’ship this year. Pam (Martin) we wish you well in the 2018 National C’ships and congrats on your many recent wins! Congratulations to Victorian Armed Bowler, Wendy Odgers on winning Singles GOLD in the All Abilities National Championships in Western Australia. You can read more about this at http://www.bowlsvic.org.au/Article-Details/updates-2018-multibowl-national-championships. Victoria collected 3 x gold medals, 3 silver medal and 1 bronze medal.